In addition to providing exceptional strength and performance, WAXIE-Green Can Liners are also formulated to reduce potential impacts on human health as well as the environment. WAXIE-Green products offer a compelling combination of performance, price, health and safety, along with an environmentally preferable profile. 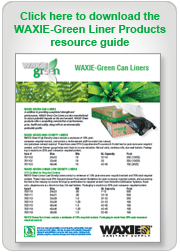 WAXIE-Green Can Liners contain a minimum of 10% recycled content. Packaging is made from 20% post-consumer recycled content. WAXIE-Green High Density Liners contain a minimum of 10% post-consumer recycled content, and contain a reinforcement additive made from natural, non-petroleum mineral material. These liners meet EPA Comprehensive Procurement Guidelines for post-consumer recycled content, and their thinner gauge helps contribute to source reduction. Natural color, coreless rolls, star-seal bottom. Packaging is made from 20% post-consumer recycled content. WAXIE-Green Linear Low Density Liners contain a minimum of 10% post-consumer recycled content and 75% total recycled content. These liners meet EPA Comprehensive Procurement Guidelines for post-consumer recycled content, and are among the first in the industry to receive third-party certification for recycled content from Scientific Certification Systems. Black color, dispense one at a time from box, flat-seal bottom. Packaging is made from 20% post-consumer recycled content.